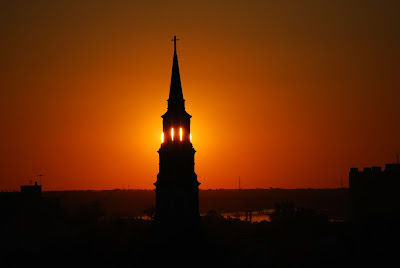 I was driving to work the other morning and saw a beautiful sunrise over downtown Charleston. The city is known as the Holy City because of all the church steeples that line our modest skyline. As the sun crept up that morning, it silhouetted one of those famous churches, shining through the windows of the bell tower. It was beautiful, that silhouetted church, but it sparked an idea -- is this a picture of the state of the church right now? Here we have an old fashioned building, the way churches used to be designed -- huge steeple that stretched into the sky with a cross on top, reminding all who see where their hope comes from, their safety and their salvation. But churches aren't designed that way anymore, and church isn't performed the way it was back then either. The liturgy of the past is widely gone, and the ornate buildings of old have been replaced by more practical warehouses and shopping centers. But in the silhouette of these buildings, what do we see? The line shines through. In these modern times with our modern buildings, ugly as they can be, life and light line the walls inside. Through the framework of our roots, the old church, we have changed in a way that allows people to see what is good and true about God. Not that the old way is bad or wrong, but as society has changed the church has to change with it, not in watering down truth, but in its way of presenting that truth. People see these old churches, beautiful as they are, but they don't walk in to find a truth that's relevant every day. Admire it's beauty, sure. Find peace, absolutely. But rarely do you find someone going to these old churches when they want to meet God and His community in a tangible way. Again, not that we are forgetting our roots -- the church and its history is rich and full of wisdom -- but as we examine the ways of old and gleam what we can from them, we press on to communicate this same wisdom in a new way that is relevant to a modern generation. The light through the silhouette.